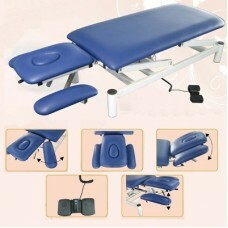 Massage table SM-22 Medspa, buy for 1673 in Europe. Two-pieces stationary massage table SM-22 Medspa may be used in any cosmetic office. Sturdy steel structure of the frame with a variable angle of the top of the table, which allows you to place the client in the most comfortable position for the massage. You can do this with the help of an electric motor and foot pedal control. The angle of inclination can vary from + 33 to -48 . At the same time there is a cutout for the face, armrests and a headrest; which significantly increases the comfort and convenience for the customer and for the beautician. More than 5 cm layer of polyurethane foam with a modern coating allows you to conveniently place the client on the surface.